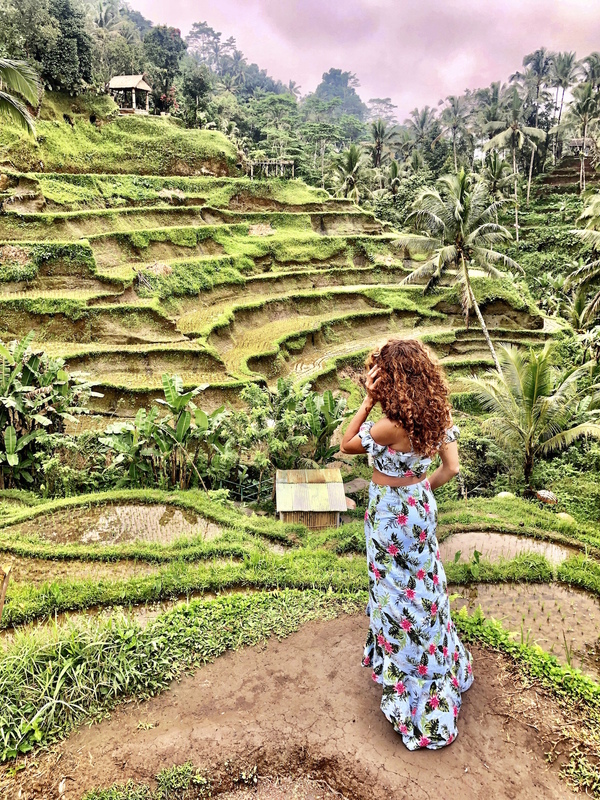 If there is any main ‘Eat, Pray, Love’ side of Bali, you’ll find it in Ubud. This laidback town that has only one place where you can dance the night away (CP Lounge – until 2 a.m.), offers plenty of sights to explore and caters to those with a sense of adventure just as it does those who want to relax, relate, and release. So, what should you do when you visit Ubud? Take a peek at our list of the top things you should experience before you leave town. (We did all of the below except for Wanagiri in five days. We’ll get into how we did it in our ‘Things to Know Before You Visit Bali’ roundup). 1. 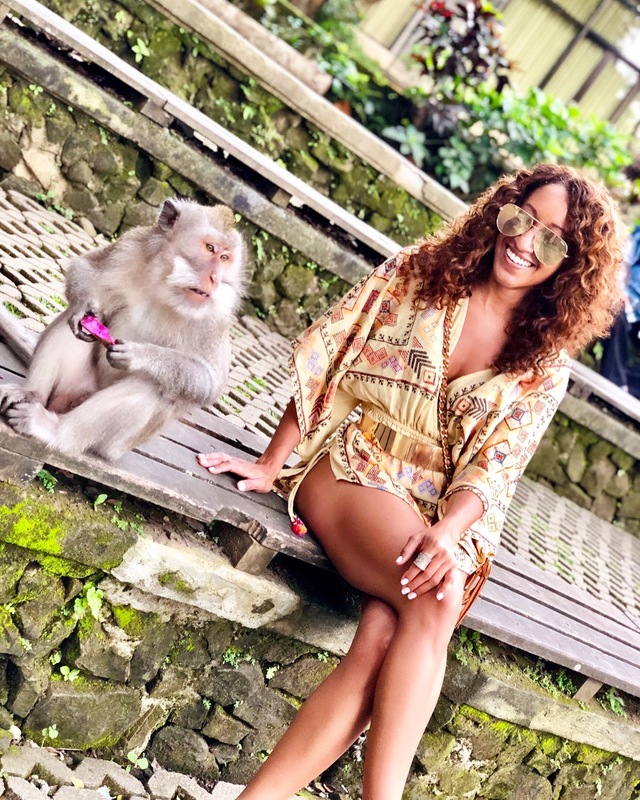 Jalan Monkey Forest: A trip to Ubud isn’t a full trip unless you take a stroll through the Monkey Forest. Located in the village of Padangtegal in the heart of Ubud, the Monkey Forest is home to about 600 Balinese long-tailed (macaque) monkeys. A visit here is just as its name suggests – you’ll be walking through a forest (which is beautiful by the way) and there are monkeys everywhere. It’s an incredible experience and should not be missed. It costs 20K rupiah (about $1.60) to enter the forest and you can spend as much time in there as you want until closing time. Hours are 8:30 a.m. to 6 p.m. daily. We had quite a few hilarious things happen while we were there. We were shocked as we approached the Monkey Forest and saw a sign that said ‘Beware of Monkeys’…and then we saw them…hanging out on the sides of the street. One pickpocket monkey even walked over to a woman who wasn’t looking, and grabbed something out of her open bag. Once we entered, one monkey climbed on my friend’s head and another grabbed my romper and started screaming. After we left and walked quite a bit away from the entrance, another monkey jumped out of a nearby tree and onto my friend to grab her water bottle. The moral of the story is it’s fun, but stay alert. 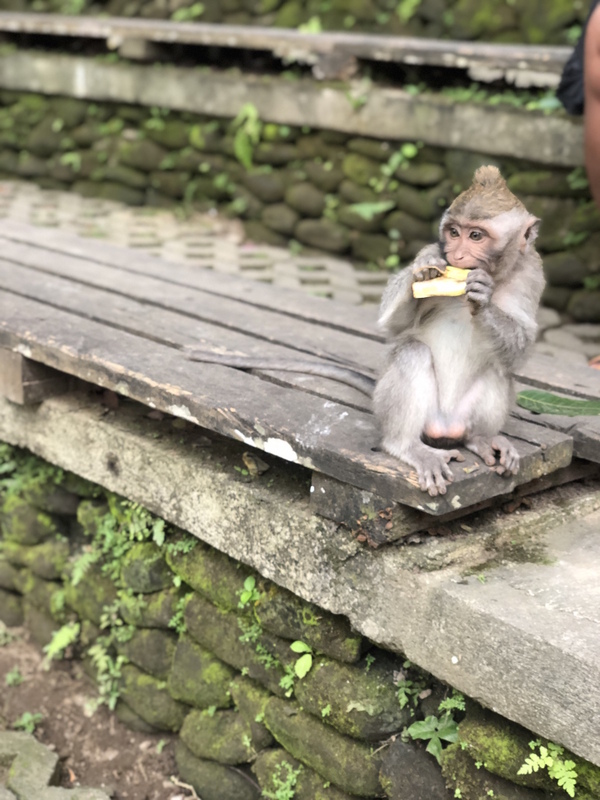 FAB TIPS: You can interact with the monkeys and even feed them bananas that you can buy at the Banana counter inside of the Monkey Forest. Still, be careful. You’re not allowed to touch or play with them, and it’s important to remember that these are wild monkeys. They’ll climb on you when you’re not expecting it, take things out of your purse/bag if it’s open, and more. You also aren’t supposed to look them in the eyes (they consider that a threat), bring outside food/drink into the forest (they’ll take it), or bring anything shiny into the forest either (they’ll take that too). We witnessed the repercussions of all of those things while we were there. 2. Tegalalang Rice Terrace: The rice fields in Ubud are stunning – and Tegalalang is one of the biggest and most famous ones in town. There are rows of beautiful rice paddies that you can walk through on a path, and several must-not-miss Instagrammable photo opps: the many rows of paddies, two swings, a giant nest, and a couple of colorful “Love Bali” signs. It costs 100K rupiah (about $7) to enter and you must give a small offering (2K rupiah is fine, which is about 14 cents) to workers as you venture through the fields. They are easy to see, given that their stands are set up right on the fields and are topped with donation jars. Not long after you enter, you’ll see the first ‘Love Bali’ sign. It costs 30K rupiah ($2 USD) to take your photo there. As you continue on, you’ll see the first giant nest and swing. It costs 100K rupiah (about $6.70 USD) to climb into both and take photos. When you get to the top of the rice paddies, you’ll see another swing, which will send you soaring over the rice terrace. That one is 100K rupiah to ride, but it’s worth it. FAB TIPS: Wear or bring sneakers or swim shoes. It had been raining on and off the day before we went to the terrace, so the grounds were wet and slippery. We were wearing sandals, so not only was it slippery, but our feet got bitten up by red ants if we stood in one spot for more than a few seconds. 3. 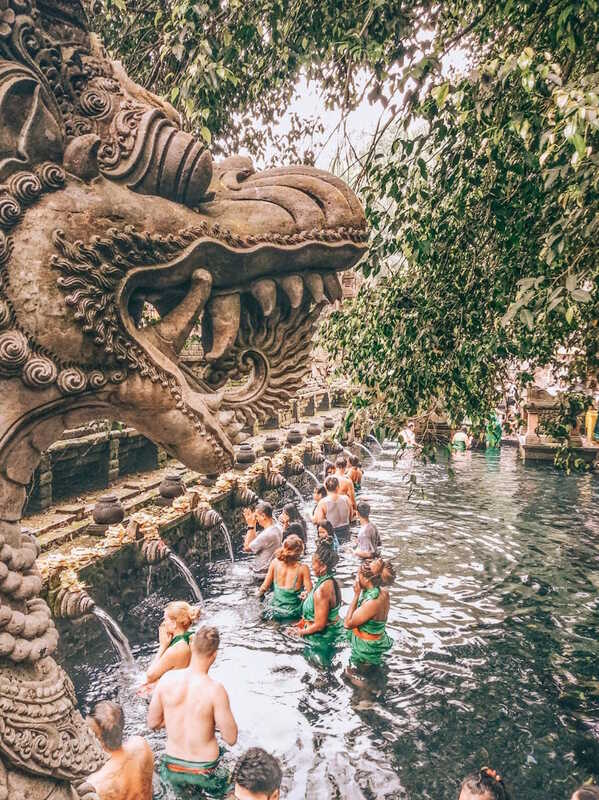 Tirta Empul Temple: Cleanse your spirit in this serene temple, which is surrounded by a dragon statue. Here’s how it works: After you pay 15K rupiah to enter the temple, you must purchase a rental sarong for 15K rupiah (if you don’t have one with you), and purchase a key for 10K rupiah for a locker to store your things in (definitely do this since you can’t take belongings into the pool area). In total, you’ll spend about $3 USD. You’ll change your clothes in a community locker room, which is basically just an area with a curtain that closes in front of it, so make sure to wear a swimsuit underneath your clothes (as a heads up, the floor is wet and a bit dingy). From there, you’ll walk towards the water, step inside of the sacred pool, pray, and splash water over your head and on your face at each spout. Make sure not to splash your face at the spouts that are used as the holy water for cremations (you’ll notice that those look different as you approach them). That is bad luck…and really eerie too. 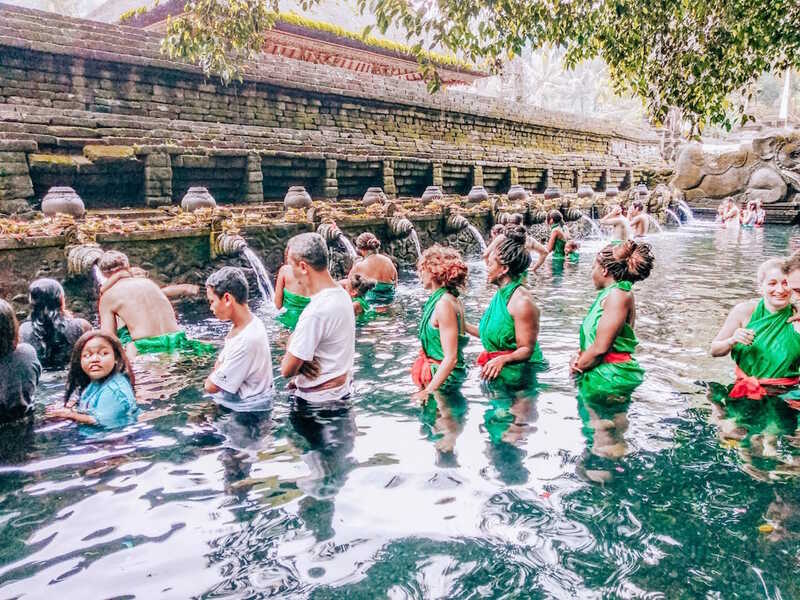 FAB TIP: If you can visit Tirta Empul during a sunny, warm day, do it. We visited the temple on a chilly, rainy day, and the water was freezing. Also, wear water shoes and bring a towel with you. Towels are not provided at the temple – and neither is toilet paper if you need to use the bathroom. As a heads up, there are large koi fish that swim in the pool too. 4. Tegenungan Waterfall: Walking towards Tegenungan Waterfall was magical. It was not easy to get there. We walked over log planks and soft slippery stones to get a close-up view of its beauty. The mist blew in our faces. The wind was strong..and yet, as we stood in front of it, we felt strong. Empowered. Free. 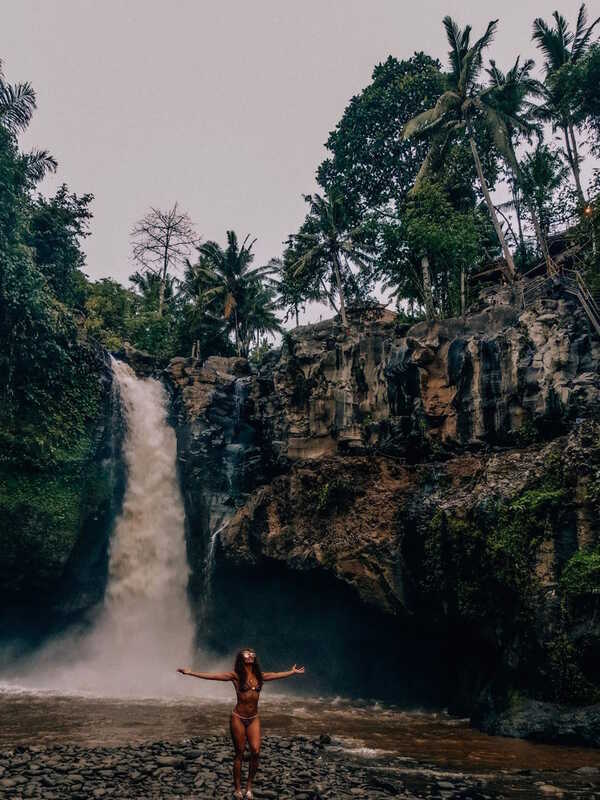 There are a few waterfalls you can enjoy while you’re in Ubud, but we would suggest going to this one. There are two sets of waterfalls here – one near the entrance that has a series of small waterfalls, and the separate, gigantic Tegenungan Waterfall. At the first, you can (carefully) climb up to its pools and get into them. At the latter, it’s usually too dangerous to go inside the water. It costs 15K Rupiah to enter (around $1 USD), and getting to Tegenungan takes some effort once you walk in. After you walk down several steps (which are a workout when you’re going back up towards the exit), you’ll walk over log planks and slippery stones to get to the actual waterfall. But seeing that powerful waterfall up close and personal makes it worth it. There’s also a nest you can climb into on the way out that makes for a rather cool photo opp. FAB TIP: When you travel to the waterfall, bring water shoes to help you get around the grounds. As we mentioned, the rocks are slippery leading up to the waterfalls, so that can help you safely get to both. 5. Nusa Penida Island: If you have time to squeeze in a day trip, this is one you shouldn’t miss. From the T-Rex shaped Kelingking Beach to breathtaking Broken Beach and the magical Crystal Bay, there are a series of beaches and landmarks on this island that are simply stunning. It requires a bit of adventure to get there – and to each beach, but it’s worth it. Take a peek at our full Nusa Penida guide, here, for full details. 6. Mason Elephant Park & Lodge: This was one of the highlights of our trip, but it’s also one of the most expensive touristy things to do in Ubud. 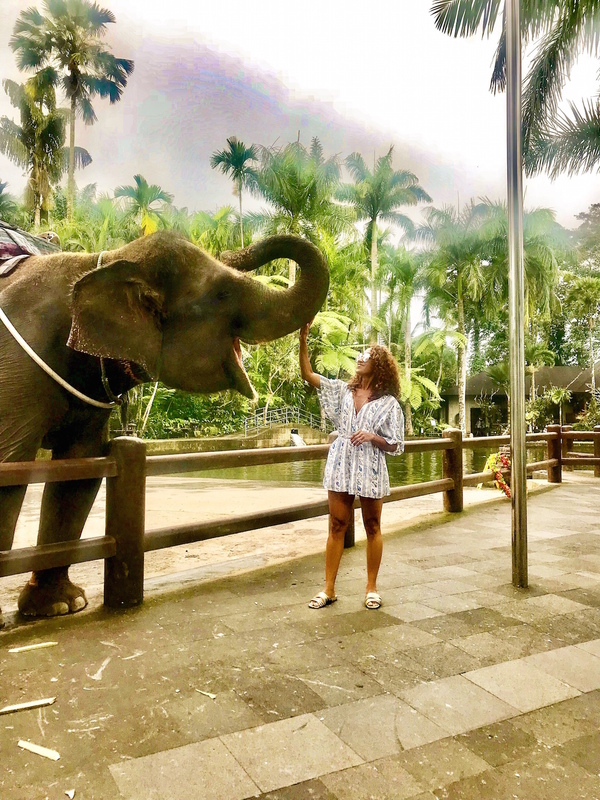 You have the option to either enter the park and feed and play with the elephants (about $23 USD), or combine that with an elephant ride for a little over 1 million rupiah (about $70). You can also choose to bathe with the elephants, wash the elephants, and/or enjoy a buffet lunch with your visit for more. 7. Flower Baths, Floating Breakfasts, and Yoga: When you want to relax and indulge, spend a few hours at Udaya Resort and Spa. 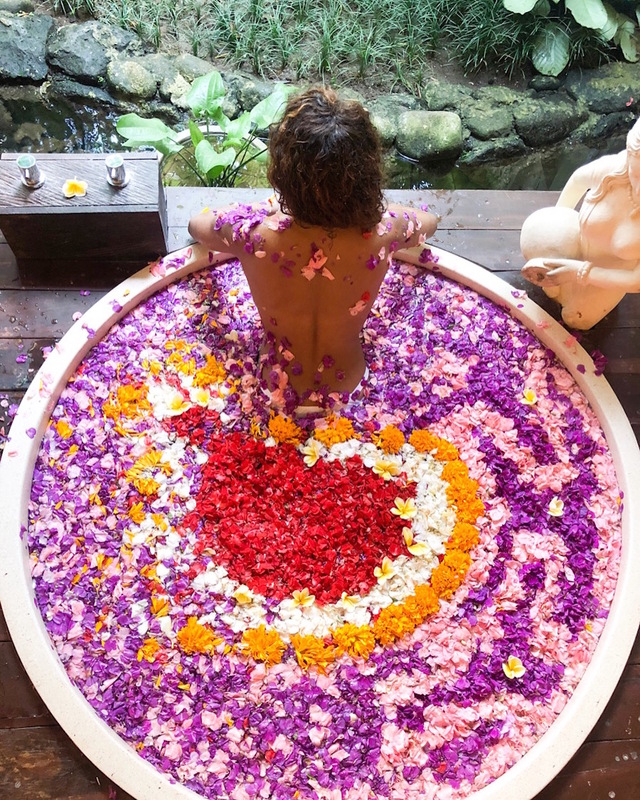 This hidden oasis, tucked away in the heart of Ubud, is the place to take a flower bath in town, and gave us one of the best massages we’ve ever had. For a flower bath and a 60-minute massage, we only spent about $65 total including tax and tip. To take things up a notch, start the day with a floating breakfast, which is brought out to you in the infinity pool on a floating tray. If you’re interested in staying at this gorge resort, you can book it here. FAB TIP: Wear your swimsuit to the spa. You can enjoy the infinity pool at Udaya and other amenities all day if you would like after your spa treatment. If you’re looking for a cheaper option, walk down the streets of Central Ubud and pop into one of the streetside massage parlors where massages cost about $5-$10. When you want to go into full namaste mode, take a yoga class at the Yoga Barn. It’s tucked away in central Ubud, yoga classes are in a room surrounded by a tranquil pond, and there’s a fresh juice and smoothie bar just a few feet away from the entrance. Classes are 130K each (about $9 USD). 8. The (Laid Back) Nightlife: You don’t come to Ubud to party, but if you’re looking for a place to take in happy hour or late night drinks, don’t miss CP Lounge (as we mentioned above) or the Laughing Buddha. We’re recapping those and more spots you can’t miss in our Ubud FAB Eats & Nightlife roundup. 9. 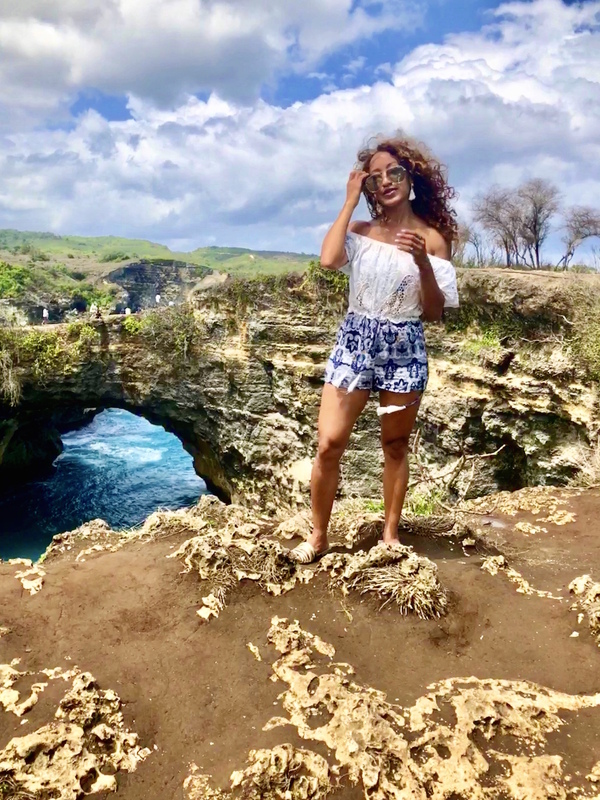 The Grub: You can take a peek at all of our fave places to wine and dine in Ubud in our Ubud Fab Eats roundup, but you must visit the famous Naughty Nuri’s. The late Anthony Bourdain swore by the dirty martinis and ribs here. We took a trip there and swooned over both too (however, the dirty martinis are so strong that we almost passed out after one). 10. The Big Bonus: Wanagiri Hidden Hills – There are swings and nests and then there is the swing and nest you can’t miss if you have time to squeeze it in. 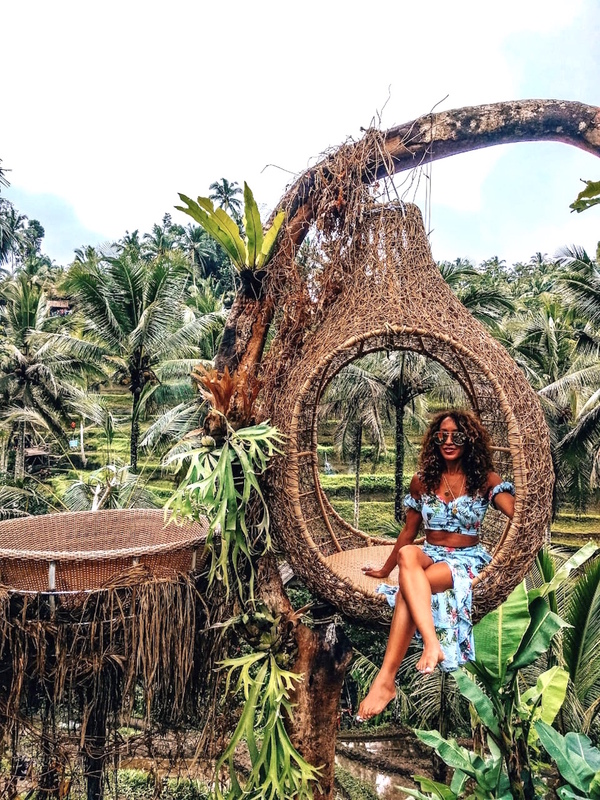 It’s about a 1.5 hour drive from Ubud, but Wanagiri has what a lot of rice field swings in Ubud do not: a picturesque view of the Indian Ocean as your backdrop. Entrances range from 20K to 40K rupiah per person (essentially $2 USD or less), and once you’re on the grounds, you can spend as much time as you want taking photos there.